One of the main DBA’s duties is to guarantee that SQL Server instances are up-to-date in terms of patches (Service Packs, Cumulative Updates or Security Updates). Recently, dbatools added a new command that turns this validation a piece of cake. Thanks to Simone Bizzotto (@niphlod) for baking up the command that Shawn Melton (@wsmelton) and I initially requested. So, I thought that this information should be shared with other people too. This new command is available since v0.9.150. Otherwise, you can use the Save-Module command and then copy the files to your destination host. How does the command works? This command uses the dbatools-buildref-index.json file that contains all the information about SQL Server builds. This is the same file that feeds the dbatools builds table already shown on the introducing the community-driven build reference blog post. To run the command, we need at least two parameters. The -SqlInstance or -Build and one of the following 3: -MinimumBuild, -MaxBehind or -Latest. In this example, I’m testing an instance that I have patched with SQL Server 2012 to SP4 but after that, the new security fix for Meltdown/Spectre was released, that is why the Compliant property shows False, it is not on the Latest existing build. Note: If you just want to check for the latest SP and CU (leaving out the security patches) you need to use -MaxBehind "0CU"
Now, let’s say that you want to confirm that a specific instance is no more than 1 CU behind. Test-DbaSqlBuild -SqlInstance <instance> -MaxBehind "1CU"
In this example, you can see that this instance is not compliant. Why? Because it is running the SQL Server 2016 SP1 CU5 but we asked for a max behind of 1 CU and that is the SP1 CU6 (because at the moment I’m writing this text, the most recent version is SP1 CU7). Keep in mind that for -MaxBehind you can also specify the number of service packs using -MaxBehind "1SP" and even use both, SP and CU like -MaxBehind "1SP 1CU". $SQLInstances = "SQL1", "SQL2", "SQL3"
Test-DbaSqlBuild -SqlInstance $SQLInstances -MaxBehind "1SP"
We saw the “online” example where we will query each instance at the moment. Now, I want to share with you two more examples. Let’s say you have a central database where you keep some of the information about your estate and one of those pieces of information is the SQL Server build version. 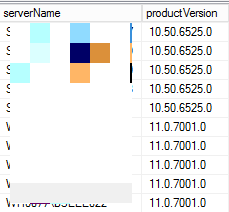 $SQLServersBuilds = Invoke-DbaSqlcmd -ServerInstance $Instance -Database $Database -Query "SELECT serverName, productVersion FROM $InstancesTable"
For this example, I will query my dbo.Instances table and get the serverName and productVersion columns. You can pick that data and pass it to the Test-DbaSqlBuild command to know if it is compliant or not. Then for each result, we will format the productVersion value to use just a 3 part value (it is how we catalog on dbatools build reference file) and pass it to the Test-DbaSqlBuild command. The other example I would like to share is using the -Build parameter. Test-DbaSqlBuild -Build "13.0.4001" -MaxBehind "0CU"
I guess I’d need to update dbatools first before running Test-DbaSqlBuild? Hi Ewan, glad you enjoy it! Thanks for the feedback. We don’t need internet access to run the command 🙂 If you are running the command from a central place, you just need to have the module on that machine up-to-date. You can run the command with the -Update parameter so it will goes online and grab the most recent version and replace the local one. If you need to run the command local on a server without internet access you must replace the file wiht a most recent one.